In 1962 and 1963 Barry Flanagan (1941–2009) was a face on the streets of Bristol. A dandy flâneur, he would saunter out from his apartment on Cornwallis Crescent and stroll for miles of an evening, especially on the pavements of Clifton between the pale cream stone of serene buildings such as Royal York Crescent and West Mall. At night, below Clifton to the south, the lights of Hotwells next to the River Avon would illuminate the sky. Flanagan referred to Bristol as handsome, and the docks as reassuring. He had a special bond with the place, which he retained long after moving away. Jessica Sturgess, his partner of many years, told me that whenever they passed within its vicinity later, he would doff his hat to what he called the mother and father of all cities. Flanagan was born in Prestatyn, north Wales, of Irish parents working in variety theatre at the time, travelling from place to place. In the late 1940s and 1950s the family moved home repeatedly. So Barry may be said to be without heimat [roughly translated as homeland] and, in a sense, an exile. Indeed, in Silâns, the magazine he edited between 1964 and 1965, he invokes the programmatic Joycean maxim “silence, exile, cunning”. Yet in Bristol, and later in London, Dublin and Ibiza, or roaming Europe in his camper, he was, as Baudelaire wrote, “away from home and yet… everywhere at home”. He would frequent the bohemian haunts of Bristol, such as the Blackboy Café on Blackboy Hill and the cider houses: the Quinton House in Clifton, the Cotham Porter Stores and the Ostrich in Hotwells. These were used by a heterogeneous community of prostitutes, Second World War veterans, working men, gangsters, students, artists and poets. He floated though this crowded demimonde. Here, and elsewhere, his extraordinary gaze, not the machismo gaze of Picasso, but a full-on perspicacious stare, disturbingly akin to that of an ingenuous but all-seeing child, took an unflinching interest in people, place and everyday circumstance and objects. Seeing particularities in them from which his expressive ability drew out beauty, he produced exquisite work from the transient and fleeting, such as the drawing he made of his neighbour, Mike Rowlands, with its shimmering attenuated line. It was in this milieu that the poet Nick Wayte and I came to know Flanagan. Our conversations tended to address the work of writers and artists other than our own, but often considered its impact on ours. They included Henri Gaudier-Brzeska, Alfred Jarry, James Joyce and Ezra Pound. Brzeska has work in the City Gallery, some deriving from drawings made in Clifton Zoo. In these, the manifestation of the organic shape of creatures may be seen as one influence on some of Barry’s later work, such as the bronze hares and elephants which he began to make in the early 1980s. Flanagan was often silent about his own intentions. However, Wayte’s gift of a copy of The Evergreen Review focusing on Jarry’s work led to his interest in the latter and his theory and practice of pataphysics, the science of imaginary solutions, and he developed this in text and image in Silâns. In 1962–3 Flanagan, Wayte and I worked various shifts at Parkers Bakery in Cotham, a hostile environment, hot, dimly lit and strictly supervised. One task during the night shift involved sending tins for filling with dough. Tins, each the size of a loaf, would materialise behind you in cubic stacks some 160 cm high and 120 cm wide and deep. They were hot to the touch, and to handle them you wore oven gloves of coarse sacking, probably flax or hessian. They were placed on conveyors which rolled through a large aperture in front of you and went on their way to be filled. As soon as you thought you had finished, when you turned back from the conveyor another stack had appeared. Out of these unpromising circumstances Flanagan carried into his practice the use of materials such as sacking, and conceived and produced works involving stacks or heaps. One such is no. 5 ’71 1971, an almost rectangular stack of sticks 60 cm high, 259 cm wide and deep and draped with felt strips. There is something atavistic about this piece, as if a druid has built an improvised sacred table upon which he has laid felt as offerings. Similarly, his experience in the construction industry, as a labourer on building sites in Bristol in 1959, on the Royal Bank of Canada, Montreal, in 1961 and at the house on Cliff Road, Kentish Town, north London, in 1970, feeds into works such as ringn ’66 1966, a heap of sand poured on to the ground. In the resulting cone of one hundredweight of sand with a radius of about eighteen inches, a hollow is made in the top. There was also the dance piece Hundreds and Thousands, conceived and produced in collaboration and performed at The Place Theatre in 1972. This involved a ton of sand being shovelled from one side of the stage to the other by Flanagan and John Hilliard to the music of Tchaikovsky’s Nutcracker Suite, through which the sound of shovelling could be heard. Built environment, dance, art and music are revealed as interconnected elements in a culture. In April 1969, driving back to England from West Germany, I stopped over in Amsterdam, where I had the good fortune of catching the ‘Op Losse Schroeven: situaties en cryptostructuren’ show at the Stedelijk. This was a seminal exhibition showcasing new work by artists ranging from Carl Andre to Gilberto Zorio. In the Netherlands op losse schroeven is a figurative expression carrying connotations of unstable foundations, and the very title of the show signals a sense of situations in which there are secret structures. Flanagan had two pieces there, kope 1966 and line 1 ’67⁄68 1967–8. Also, in the catalogue, there are his drawings amsterdam canal project ’67 and Amsterdam sea project ’67, concepts which were partly realised in the making of the film a hole in the sea 1969 with Gerry Schum, where the brief illusion of a hole in the sea is created using a transparent cylinder. 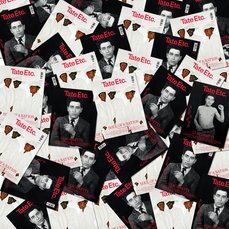 Like the title of the exhibition, the exhibits seemed to signify ways in which the artists found themselves unable to relate fully to whatever formed the cultural underpinning of previous practices. At the same time they were articulating concepts in new ways, which sometimes veiled their intellectual formulation while allowing methods of construction to shape the features of the work through organic characteristics of the often everyday materials. Back in England later that year, I caught the ground-breaking exhibition When Attitudes Become Form when it came to the ICA (the show, curated by Harald Szeemann, had travelled from the Kunsthalle Berne). 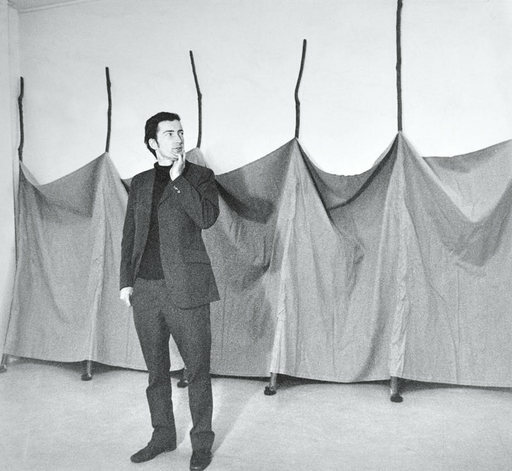 In London, Flanagan exhibited five pieces, including june 2 ’69 1969, a precarious construction of three wooden poles 29 cm high leaning against the wall on which is draped a length of flax 400 cm wide. The folds in the drapery of the flax take on the chance forms they do as a result of the process out of which they organically occur. The apparent simplicity of the structure of june 2 ’69 partly masks an elusive mystery and depth it almost secretly invokes. For, as art historian Jo Melvin has acutely observed, in Flanagan’s practice there is a “preoccupation with… presence, absence, the solid and the fragile, the material and immaterial”. To me, these blissful objects of Flanagan’s and other artists in the two shows were a revelation. He spoke something of the current zeitgeist, the uncertainty of the flux of that period of time, but they also carry a timeless aspect. They are grounded in the relationship between recognition of objects in everyday life and their transformation. You see this particularly in line, where lengths of felt strung across the gallery resemble the laundry of a nomad. There is something of the sorcerer in Flanagan’s transformative power. Nevertheless, in the works I have mentioned, as well as in the stone, steel and bronze pieces he turned to subsequently, he shows his hand, often allowing the process by which the works are made to be evident in the finished piece, as in the partially exposed armature of Neither Fish nor Fowl 1979. In the stone pieces we can see echoes of the stones of Bristol. The bronze hares, begun in 1979, were transmutations into anthropomorphic shapes from the outline of the dead hare in his studio which he drew in its blood. To partly echo Jo Melvin, they ring with connotations of Vulcan’s anvil and the rich veins of hare symbolism in the world’s various cultures. In the breathtaking boldness of the conception and execution of new metal piece 1978, a single sheet of free-standing mild steel 21 cm high by 45 cm wide and 21 cm deep, cut and pulled open to form an integral half lozenge and spiral, ancient signs, such as those in the intaglio carvings in the portal stones of Newgrange, are pushed beyond their traditional boundaries. Between 1964 and 1965 copies of Silâns reached Bristol from London, where Flanagan was then based. They would circulate from hand to hand among the poets. We were alienated from the kind of poetry which had been dominant in the UK in the 1950s to early 1960s, with, as the poet Andrew Crozier writes, its “common rhetoric that foreclosed the possibilities of poetic language within its own devices: varieties of tone, of rhythm, of form, of image, were narrowly limited, as were conceptions of the scope and character of poetic discourse, its relation to the self, to knowledge, to history, and to the world”. We also wanted to step beyond the limits of the canon of poetry established largely by courses of English literature current in the academy. There were a number of influences which helped us to do this, but we took to Flanagan’s work as an extraordinary source of restoration. With its openness, varieties of form and image and admission of the operations of chance, a model was being provided. I wanted to produce work whose features and language were as much grounded in the relationship between attitude to and recognition of the acts, objects, places and people of the quotidian and their transformation, as was Flanagan’s. I also wanted to bring his vitality of observation and way of being into play. To this day, his whole life’s work continues to be a significant part of what shapes the practice and production of poetry, wherever the quest is to make a writing beyond literature.